NorseCare residents benefited from a £20,000 Comic Relief grant to develop the skills and confidence of staff in residential care homes. Under the initiative, specialist activities and wellbeing provider, Oomph! Wellness, provided sessions at the homes focusing on ensuring people are happy and engaged in purposeful activity that they enjoy. Residents now enjoy a range of activities, including seated football and badminton, yoga, art, pottery and drawing classes, as well as exercise classes three times a week and choir sessions, while staff have developed ‘Life stories’ to really get to know residents better. 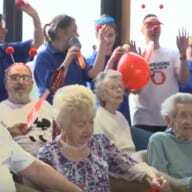 The post WATCH: Comic Relief brings smiles at Norfolk care homes appeared first on Care Home Professional.